I can't quite believe it. Intense Cycles have just released another bike. They've obviously been cracking the whip in the office, or have changed their energy drink supplier because this is unheard of from a company that really is small fish in a big barrel. Three new bikes in just a few weeks. Great timing for the team at Wideopen Distributors who have recently taken over the Kiwi end of Intense as these new bikes are a huge step forward into the modern mtb sales race that is seeing all the brands battling it out to get in front of the pack with all the new Plus bikes, long frame reaches, and trying to work out if Enduro is still cool , are 29ers coming back or is Plusbike adventure trekking the next big thing. Goddamm...I might just go and buy one right now. That Graeme Murray sure takes a good photo. (photo: Graeme Murray) This is what it looked like before Weasel got his hands on it.. Here it is in the real world before I took it down TTS in mt. Victoria, Wellington . A 140mm traveled, 66 degree head angled 27.5" wheeled trail beast. Enough of that. Have a look at this new Recluse from Intense . A 140mm trail beast that looks like it's replacing the 275 Carbine. To me it's more like a short travel Tracer what with it's 66 degree headangle. But that's just nuts... unless...? Oh yes, I bet the new Tracer (or will they even call it that) is going to be even burlier and lazier...we'll just have to wait and see. As with their new Primer 29er and the ACV Plus bike, the recluse is sporting the revised VPP linkage system which sees the lower link shortened and tucked in above the bottom bracket for better ground clearance, shorter chain stays, a better shock spring rate and a sleeker tidier look. The lower link still sports the grease ports into the proven collet axle pivots. This Recluse that Wideopen sent to me is a custom build that they have put together and will travel the country as a test bike so I don't want to go too much into the kit on the frame but they are offering a frame only option along with two build kits. The Foundation build and the Rotorua build. The bike I have here is the Rotorua build as per fork , shock and XT groupset option. The Foundation comes with a Pike and Monarch Plus R Debonair. Bolt on a Float X2, a 150mm Float 36 and this bike is a bruiser. It almost felt like it was too much bike for me. So stiff and stable. This is the first bike I have ridden since my Santa Cruz Nomad that made me feel like the bike was taking me for a ride. It can be pushed hard. I gave it some serious stick on some pretty demanding trails and came to the conclusion that it could handle any trail surface or hard landing with confidence. But it did have to be ridden very aggressively to get it to float like a butterfly. I put this down to two things. Running 140mm rear and 150mm front makes the burly X2 shock and 36 fork feel more powerful than if they were in a longer travel package. Also the frame is stiff, way stiffer than the current Tracer and feels like it has a very linear shock stroke. I ran it at about 30% sag and it wasn't overly plush and still bottomed out very gently. It felt very strong throughout the spring curve which makes for a fast bike that snaps out of the corners and pedals surprisly well. I had a few climbs with the pedal switch on but then left it open as it didn't seem necessary. I run an X2 on my Bronson, and I expected the ride to be the same, it is a very similar design after all. But I reckon this Recluse would eat the Bronson for breakfast if we are talking about a high speed pedalling aggressive trail ride. The Float X2 is a serious shock that can tame any trail. It is a DH shock after all. The Recluse runs a 200x57mm with 6mm titanium bolts. So what else is new? It's Boost 148x12 .The cable routing is all internal and because of the new lower link is much tidier but still exits in front of the BB, goes under the BB and then into the chain stays.There isn't individual housing tubes inside the frame so unfortunatley you have to piss about a bit to prevent that dreaded cable rattle. On the plus side this means that you can run any cable through any port and get it to go where you want so is a huge bonus for us Kiwis who run their brakes moto style. A big leap forward for Intense is their new longer reach measurements. This large Recluse has a reach of 460mm which makes it one of the longer bikes on the planet, the same as the Patrol, Process and Reign. What is also a standout are the super short 16.5" chain stays which sure help in the snappy handling department. Big bonus points for Intense also in that they have replaced their unreliable seat stay/rocker bolts for a third collet axle system. this makes for a stiffer frame, and also if things loosen up, then you are much less likely to suffer any thread damage as with their previous frames. While we're looking at the frame and it's geo, I am a little disappointed at the tall seat tube length. 19" for a large is a bit last year and I had to slam the post all the way down to fit the beautiful Thomson 6" covert dropper. 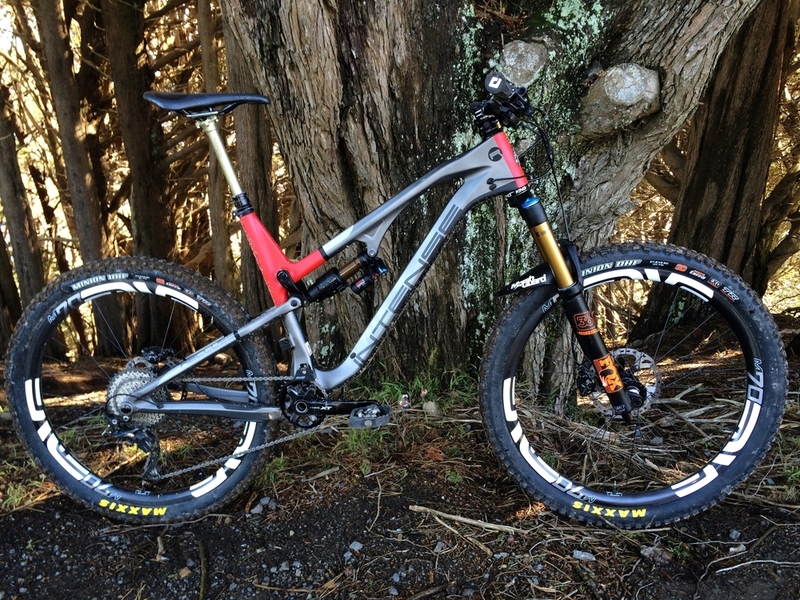 I'm 183cm and like to have a bit of room there so I can drop my seat even lower for those rad heli drops I do in Marlborough all the time (I wish) or run the new 170mm dropper when it finally arrives. This may not be a problem for you but when God made my legs he had to shorten them a bit to fit my Adonis like pectoral slab and abdominal wall in. And while on that bummer, you can't fit a drink bottle in the bottle cage unless you run a non-reservoir shock...That's not Enduro is it? On the plus side, if you have to stoop to get through doorways, then the 20" seat tube on the XL, along with the massive reach of 486mm means that finally here is the perfect bike for you. It's a great looking bike with stunning curves and a very low standover. See how tucked in the lower rocker is now. Lord Weasel got to break it in before it came to me. Weasel used to smash the boys in DH last century. Now he builds dark trails in Vegas like "Def Leppard" and....Oh, sorry, that ones a secret. photo: Graeme Murray. Rotorua. While I may have lead you to thinking that this bike is a weapon for big boys we need to look at the Foundation build. Run a Monarch Debonair on this frame, add a less grunty wheelset (these Enve M70 HV rims could handle Dwayne "The Rock" Johnson) slip in a Pike or a Float 34 and it will transform into a spectacular trail bike that anyone would be happy with. I always have a chuckle at lighter or more timid riders on their over built rigs. There's nothing wrong with a little flex and give in a bike, it gives it more pop and personality. Big forks and wheels are for big and/or heavy riders. We are all trying to get a handle on what the perfect bike is. 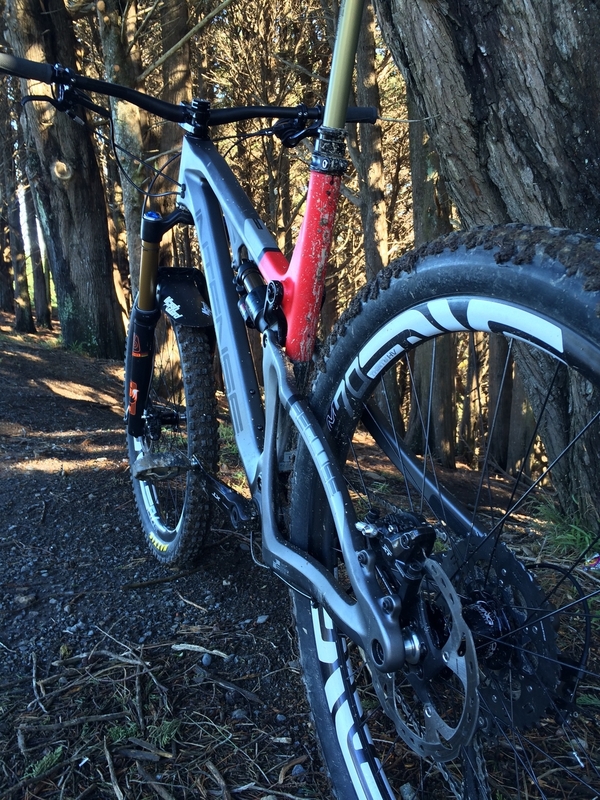 Trends suggest that a 160mm Enduro rig is the flavour right now. But those rad cats in the DH scene always seem to choose a 140mm trail sled for their daily rider. Up until recently those medium travel bikes weren't actually built strong enough for those thrashers, but after riding this Recluse I am back in favour of crisp and snappy. All bikes seem to climb well these days due to shock technology, and descending is only a small part of our ride. So it makes sense to get a bike that excels in just pedalling and coasting along, right? 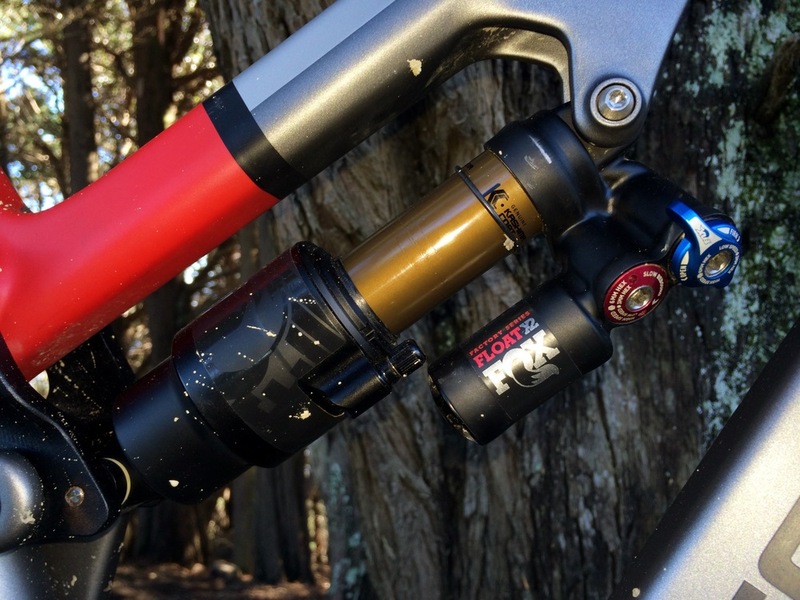 What the Recluse gives you is a short travel DH bike that weighs the same as your standard trail rig. Now why wouldn't you buy a bike just like it? I'm a big fan of the VPP linkage system and this new iteration is so much better in all aspects. I could get in trouble for saying it, but the new lower link brings the design very close to the DW Link, which is another winner in my eyes. Small bump compliance is exceptional and pedal bob is drastically reduced. You get a strong and stiff rear end and the collet axle system helps the large angular contact bearings from premature wear and the grease ports help you keep them slick and crud free. Intense have hit the ground running and I can't wait to see what they throw at us next. The good: Light, stiff, low standover, Kiwi spec option, reliable pivot system, great geometry, ultra cool brand, rides really well. The bad: Rattling internal cables, tall seat tube. The ugly: No room for a bottle with a reservoir shock ( do you realise this means no bumbag wearing ). They sure know how to colour code huh! Intense have a new carbon wheelset too. We are just showing you the frame colour options. The builds are not for NZ. This would sell really well in NZ. It'll go perfectly with your mullet. I'm thinking this colourway will go well with your bumbag, mmmm...I wonder if it's for the girls? Boost rear and the 36 fork here is boost 110x15 also, but you can get the Pike in 100x15. Wideopen bring in some exotic brands, so I'm sure you could easily fool around with your build spec. 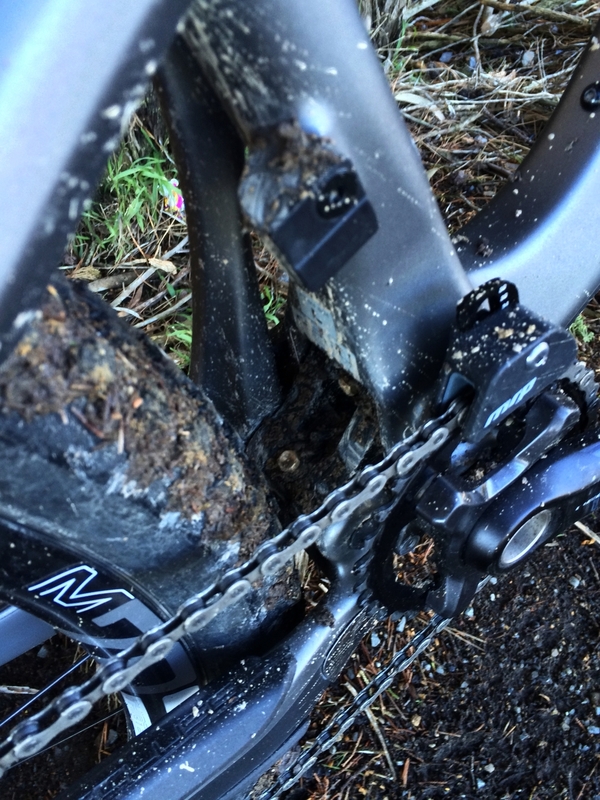 You didn't believe me about the 16.5" chain stays until you saw this pic huh? All tucked in tight. An oval ring from Absolute Black, one of Wideopens brands, along with Thomson, Chris King, Enve, Mrp, Stans, FSA and now Intense among others. Check out those sharp angles. Intense carbon frames are designed in Germany. When those guys aren't running around at beer festivals in rubber outfits they really knuckle down and do outstanding work.